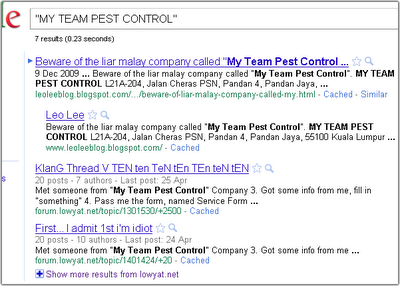 Data0.Net Security Blog: "My Team Pest Control" - Malaysia Real World Scam? 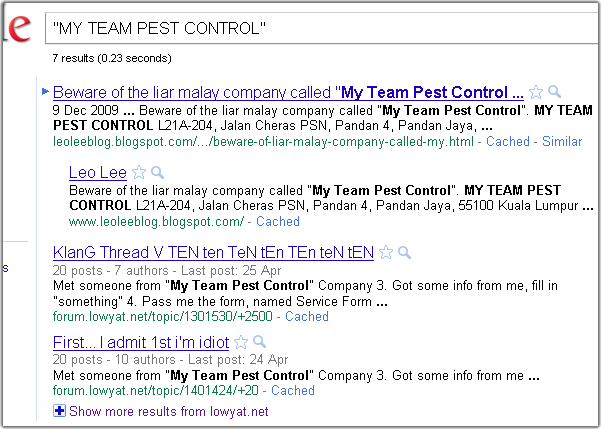 "My Team Pest Control" - Malaysia Real World Scam? Well, just a few hours ago a friend of mine has been scammed by local company that introduce them self as a registered pest control for mosquitoes, termite and blah blah blah. As I see from the receipt, the company has nothing to do with Ministry of Health (MoH). If so, they shouldn't force people to pay their services because government already pay their contract. Then, I just tell him to report to the police. After checking their company registered number at Companies Commission of Malaysia, it seem that it has been registered. But who know what they were working for. There is a lot of such scam in real world. Sometimes people can't decide which is real or not when they has been scammed in polite way at the first conversation. Base on Google Search, it seem a lot of people is already being scammed by these scammer. NOTE: I will update later for the receipt sample.